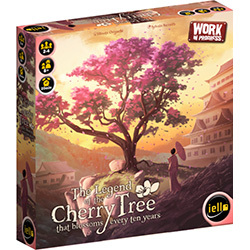 Iello Games will release The Legend of the Cherry Tree that Blossoms Every Ten Years in April. 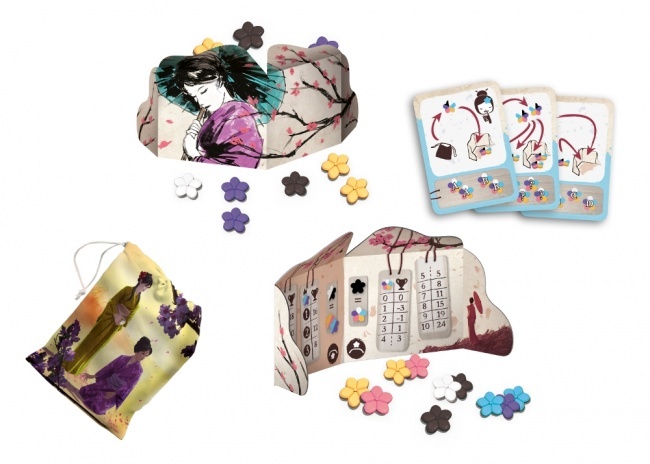 Designed by Hinata Origuchi and illustrated by Sylvian Sarrailh, the push-your-luck style card game was announced at Gen Con (see �Iello Reveals Upcoming Plans�). When the cherry tree blossoms once a decade, the flowers are highly sought after. As they fall, players attempt to catch them before they wither, as legend states that the person who gathers the most flowers will have their wish granted by the tree. But if a player is too greedy, the tree will find them unworthy and won�t grant their wish. Players take turns drawing flowers from a bag, trying to gather as many as possible. At the end of their turn, they put the flowers in front of their screen to gain victory points based on sets, or behind their screen to gain points by having the largest group of flowers. The player with the most victory points at the end wins. The box includes 4 screens, 1 bag, 3 Prowess cards, 96 flowers (18 pink, 18 yellow, 18 blue, 18 purple, 18 white, 6 black), and a rulebook. The game is for 2 � 4 players, ages 8 and up, and plays in 20 minutes. MSRP was not announced. The game will release on April 5 to brick and mortar stores and April 19 online.